Description: Good looking unit. Unknown photographer. Description: A northbound freight rolls through Amqui with a GP38-2 still in L & N colors. Description: CSX 7659 heads southbound freight past the north end of Bostic Yard during a heavy rain shower. Description: CSX 7659 heads through a heavy rain shower at the north end of Bostic Yard. Description: Another southbound heads through Gallatin on CSX's Main Line Sub. Description: Another southbound manifest heads through Gallatin. Description: CSXT Southbound Freight Train passing through Flint City, Al. Description: UP Westbound Intermodal Train at Houston, Tx. Description: A early Q611 thunders through Union City Ga. with a pair of CW40-8s. Description: Leading a westbound coal freight out of Curtis Yard on the EJ&E branch line at the Clark Road crossing, Pine Junction. Description: CSX #7659's train - after traversing the EJ&E's mainline "horeshoe" at Pine Junction - has arrived at the west terminus of the J's Kirk Yard and is waiting for clearance to enter the yard. Description: Q-348 heads east on the number 1 main on CSX Indianapolis Line at about 60mph. 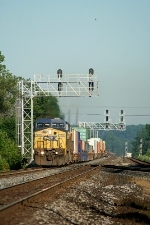 Description: Q-348 heads east on the CSX Indianapolis Line. Description: Eastbound Q-348 is rolling hard on the #1 main of the CSX Indianapolis Line. Description: Far from home, two CSX units lead a westbound APL stack train through Yuma, AZ, destined for California. Description: Westbound stack train passes the station. Description: SB mixed freight, Camp Meeting Avenue, 1720 hours. Description: Pittsburgh Avenue, Erie, Pa. Description: Q-358-09 heads East on the CSX Indianapolis line as 25A passes by on the New Castle District, not in view. Description: Eastbound Q-358-09 runs on the CSX Indianapolis line. Description: A CSX C40-8W in need of paint leads Q226 northbound, about to hit the streets of LaGrange as American flags wave in honor of the Memorial Day holiday. Description: UP's QSRLI-24 waits on UP's Strang Sub.